Diamond diggers in Africa often dream of finding a gem that will make them rich. Those dreams are not usually fulfilled. Digging for diamonds is a lot like buying a lottery ticket. The chances of winning are very, very slim. In March, Emmanuel Momoh won the equivalent of the Powerball jackpot. Momoh is a miner and an Evangelical pastor in the Kono district of Sierra Leone. He manages a small team of diamond diggers that came across a stone with red speckles, about the size of a hockey puck. They almost ignored it. Then they realized that it was a massive diamond. The gem, weighing 709 carats, is the largest diamond found in Sierra Leone since 1972. It is possibly the 10th biggest diamond ever found anywhere, and it could be worth more than $50 million. The gem’s discovery is a major event in Sierra Leone, an impoverished country that has faced both a civil war and an Ebola outbreak in the past two decades. But the diamond discovery has the potential be more than an incredible news story. If Sierra Leone’s government makes the right choices, Momoh’s diamond discovery could help build a more prosperous Sierra Leone and a fairer diamond industry in the country. Sierra Leone’s diamond miners often accept reduced wages in exchange for a percentage of a mine’s earnings. Assuming Momoh had such a deal with his employees, he will share some of the profits with them. Momoh and his men will then need to pay income taxes, returning part of the profits back to the government. In the end, the government will collect a significant amount of revenue. Too often, governments in diamond mining countries lose mining proceeds to corruption and mismanagement. It is vital that the government make good use of its share of the profits to fund health care, education, infrastructure projects, and other development priorities. These types of investments could provide immediate relief to Sierra Leone’s people and could promote long-term economic growth. We are hopeful that Momoh, too, will choose to reinvest in community development. What is just as important, however, is for the government to conduct a transparent sale. Momoh set a powerful example by choosing to work with the government rather than evade it. His choice creates an opportunity to change Sierra Leone’s diamond industry in an important way. Assuming the sale is conducted in a transparent manner and that Momoh receives his promised share, it could encourage Sierra Leone’s diamond miners to come out of the shadows. 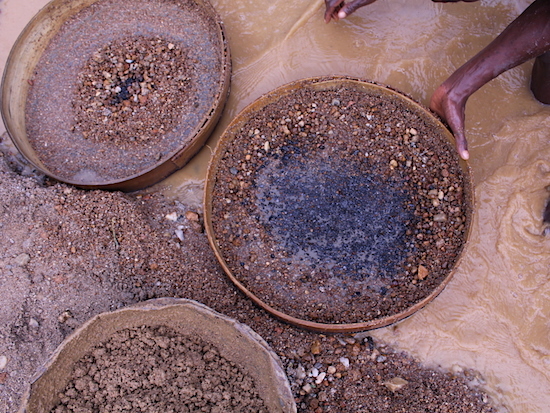 Many diamond miners in Sierra Leone do not have a mining license. They mine outside the formal system and often sell their gems illegally to diamond smugglers. For miners, there are advantages and disadvantages to becoming licensed and selling their gems through formal, legal channels. But overall, experts believe that coming into the formal system is a better deal for miners and for the public. Although miners must pay taxes, they enjoy more stability and are less susceptible to predatory buyers. In addition, their taxes can be used for public investments. The need for miners to earn legal recognition is a reason why a group called the Diamond Development Initiative (DDI), which Brilliant Earth supports, is planning a registration drive to give legal status to unlicensed miners in Sierra Leone. In this instance, it appears that Momoh has done everything in a legal way. He has a mining license. Moreover, he chose not to smuggle the diamond out of the country, instead asking the government to handle a public sale. Momoh may have reasoned that even if he had to pay more in taxes, he would fetch a higher price, and would be less likely to be stiffed, if he cooperated with the government. It is now up to the government to prove him right. If the government bungles the sale, it will signal to Sierra Leone’s miners that they are better off avoiding the government and operating outside the law. But if the government can broker an honest transaction and provide Momoh with what he is legally owed, it will demonstrate to the country’s miners that it is a good idea to become licensed and sell through legal channels. More of Sierra Leone’s diamond miners could choose the formal economy, obtaining the legal rights they need to prosper. Momoh was lucky to find a spectacular diamond. Now it is up to the government to capitalize on his discovery. By making smart public investments and by handling this matter with transparency and fairness, it can ensure that everyone in Sierra Leone shares in Momoh’s good fortune.